So a lot has happened since Book 2 no? Toph has learned to Metalbend, making her the first ever Metalbender in existence, Aang has been attacked in the back by Azula whilst in his Avatar State, Iroh has been branded a traitor and Zuko has joined forces with Azula. Now, everyone thinks the Avatar is dead because of Zuko due to Azula giving all the credit to her big brother and telling their father that he killed him, meaning Zuko can now go home. Iroh is in prison now, but he's not just sitting around. Book 3 begins when Aang wakes up. He was healed by Katara using the Spirit Water she obtained back in Book 1 (if i remember correctly), and he now has hair. The group is undercover in the Fire Nation and Aang is told that the world believes him to be dead again. During this season Zuko learns more about his mother and his father, and is in two minds about whether coming home was the right thing for him to do after learning something else that is connected to him, which I shall not spoil here. 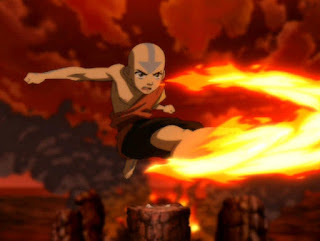 And as shown by the image on this post, Aang finally learns Firebending! But it takes a while for him to build up the courage to do so after what happened in Book 1 where he accidentally burned Katara when Jeong Jeong taught him. He is taught by Zuko who decides to change sides to help Aang. Also, there are some episodes when Zuko has some bonding time with each of the group, which is quite cool. And let's not forget Sokka, who hasn't learned anything new unlike the others in the previous Books due to being the only non-bemder in the group. He takes the opportunity whilst undercover to learn the way of the sword from the best swordsman out there, and gets his own sword! Things get underway as the group choose to infiltrate the Firelord's palace before a great event occurs: Sozen's Comet. We learn of the significance of this event through Aang and Zuko, and why it is essential for Aang to defeat Firelord Ozai before the Comet passes the Earth. This is a perfect way of ending Aang's journey to learn the remaining elements and stop the 100-year war, and isn't afraid to use his non-violent teachings to end it. But it doesn't just stop there as there are some comics (The Promise, The Search, and The Rift) filled with events that happen after the anime, such as Zuko finding out what happened to his mother. The quality of the story and characters isn't forgotten in these, so you'll enjoy them just as much as the anime. Avatar: The Last Airbender never ceases to amaze and is an anime everyone should watch, even if it isn't Japanese.